I am trying to find meet and greets for the may 4 show at the Tyson event center in Sioux city Iowa? Can u help me please ? I can not find where to purchase Meet and Greets for the show this sat. I was looking at the comments below. Are they really $2.000? I just called to purchase meet and greet passes for my daughter to see Kelsea in reading pa on April 12. And they are $2,000 a piece. We already have show tickets. She just wanted to meet her. This is outrageous. We met Cassadee Pope. We met Lauran Alana. We are meeting Carly Pearce. But not Kelsea Ballerini. My daughter is so disappointed. My daughter and I cant wait to see you when you come to Augusta, GA! Your my daughter's idol and I know it would mean the world to her to meet you and be able to take a picture with you! Thanks for being such an inspiration to all of the ladies out there! Hi Kelsea, coming to see you tonight with my daughter and granddaughter. We have been big fans for 4 year. My granddaughter is so excited. 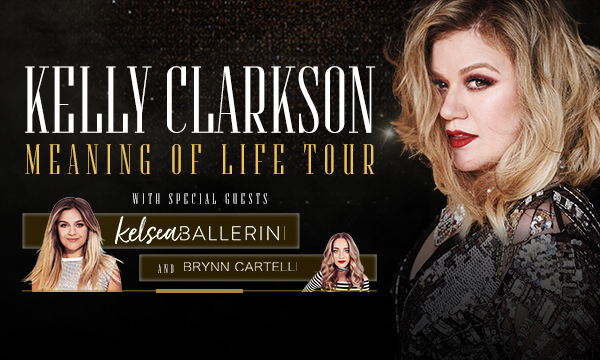 OMG I just won tickets to see you with Kelly Clarkson on March 23 and I believe I am more excited to see you than her!!!! I’m so excited you’re going on tour. I love your music and can’t wait to see you perform!!!! I would love to know if you are coming to the UK this year. Myself and my young daughter are huge fans!!! I’m taking my son Derek to Nashville for his 21st birthday.....his only wish was to hopefully run into u there.....and what are the odds....u are going to be at the Grand Ole Opry the weekend we are coming....so we bought tickets - U could make my son’s 21st birthday AMAZING and make his dreams come true if he could meet u - can u make this happen ? Sincerely.....the coolest mom on the planet if u say “yes” !! !